Wow, I’m so excited! I have a fantastic home competition for you to take a look at. How would you like the chance to win £300 to spend at the online furniture retailer Furniture Choice? You can choose to use the credit to put towards a larger item of furniture or, at the current sale prices you could even buy something outright. 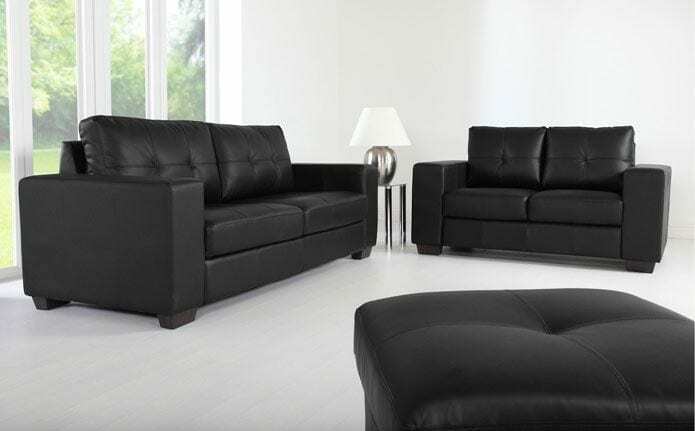 Furniture Choice offers a massive selection of Leather Sofas for everyone’s budget. How about the gorgeous 2 Seater Leather sofa in this picture which sells for just £299.99. In fact, you can get the 3 Seater as well for just £599.98 (at sale prices). Or maybe you’d like a new bed? This white leather King Size bed is just £249.99 in the sale (normally retails at £374.99). Furniture Choice don’t just sell furniture they also sell a great selection of Mattresses, from Single right the way through to Super King Size and even Orthopaedic mattresses. You really will be able to put your prize to very good use. Or why not put the money towards a fabulous new dining set. 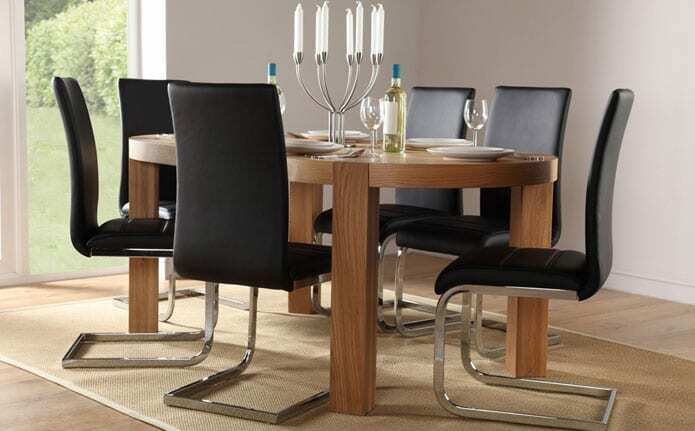 This Table and 6 Chair set is available from £599.99 at the moment, but honestly, the choice of dining sets is huge. If this one isn’t for your, there’s definitely one that will be! Furniture Choice has a huge range to choose from. Great sofas, fantastic dining sets and beautiful beds too. Set up in 2005 with the aim of bringing great value, quality, contemporary furniture online, Furniture Choice has quickly grown to become one of the UKs leading online furniture retailers. Their contemporary furniture is beautifully crafted from solid oak, high-quality leather and hardwearing fabrics but you’ll struggle to find better prices. And one more thing, delivery is free too! Here’s what you have to do to be in with a chance of winning this fabulous prize. I would like you to create your own Pinterest Board depicting your ‘Dream Living Room’. Follow Love Chic Living on Pinterest. Once you’re happy with your board, come back and add a comment to this post including a link to your board. The competition will be open for a month so if you’re not a Pinterest member just yet you have chance to become one and create your board. You can join Pinterest here. The Love Chic Living team is really looking forward to reviewing your boards. Remember to give them a wow factor, add comments to your pins and give us a great sense of what your dream living room would look like. 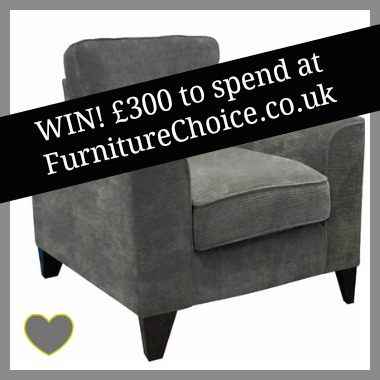 The prize is a £300 credit to spend at Furniture Choice online website. There is no cash alternative. Winner must respond to the email within 7 days or forfeit the prize. Another winner will then be chosen. The prize will be given direct from the PR company and Furniture Choice. Wow i love this 70’s theme really retro. Thank you – it was great fun doing this! Here’s my grey and mustard yellow (very 2012) themed Living Room http://pinterest.com/emilybeale/furniture-choice-competition-board-with-love-chic-/ Thanks Chic Living, what a fab competition. My board is based on the lovely “Triton 3 Seater Sofa Bed (Brown)” I’ve then created a chocolate brown themed board to compliment the colour of the sofa. This is an inspiration for a lovely chocolate palette living room. Awww, tyvm – had amazing fun doing this! Which my house looked so good haha! Not sure if I’ve already added my link, so here it is (just in case I haven’t!)! Here’s my entry great fun doing this and have some serious design envy now! Here is my neutral- minimalist, vintage chic dream living room. My board depicts what my living space needs to be – feminine for me, bold for the hubby hence the union jack, an an area for the kids. Here is my Black & White inspired room. Dream lounge. Imagine a spacious loft apartment with wooden floors and painted white brick walls. There’s a few corner sofas and chairs, lots of cushions and little bits of lovely wherever you looked. Hubba. Buying my first home soon, love all the ideas on here! Got a bit carried away, so much to chose from. I looooove the upcycled and creative stuff. Love it love it love it! Here is my board – if only money was no object! My dream living room would use neutral, earthy colours, use traditional materials with a modern interpretation and quirkiness to them and most of all be cosy, comfy and relaxing! Though I may struggle with the ‘boat living room’ a little.. Indoor pond anyone? Good luck all. This is my first shot at a pinterest competition. Some wonderful stuff there.. Sorry – I didn’t think my comment worked the first time ! Here is my board, to me this would be total perfection. I really enjoyed letting my imagination run wild on this one! Thanks for a great competition it was really fun to do. I loved doing this… Can you tell I love owls?…. Hi, I’ve created my dream living room and had great fun doing it! An elegant, classic room to mark the new era of my life. I was spoiled for choice on your lovely website. My theme was informal and comfortable but upbeat and joyful with artful use of colour. Here is my link, loved the competition! Which was the winning entry???? Winner being announced in the next couple of days Claire! Lots of entries to judge! !